SANTS recently celebrated the graduation of 256 Newly Qualified Teachers in Soweto, Gauteng. This included graduates of the Diploma in Grade R Teaching and Bachelor of Education in Intermediate Phase Teaching programmes. SANTS was honoured to have had Dr Keshni Bipath as the keynote speaker. I am privileged and honoured this morning to be a part of SANTS on your important day. Graduation Day’s is perhaps the greatest highlight in the life of a student. It marks the end of a chapter for the 256 graduates sitting in front of me. It is a time of farewells, but also a time of great excitement, like you, the graduates of 2018, embark on new adventures and you make your indelible mark in the Early Childhood Development World. It is the coming of SPRING in Early Years Education, as Early Childhood Development has become a national priority. You have taken the step in the right direction as your responsibility is to mould the minds and thinking of the young child— who will be the future leaders. Ralph Waldo Emerson once stated: “To know that even one life has breathed easier because you lived – that is success”. Early Childhood Development has arrived—both in Africa and around the world. The world knows now the learning begins at birth. and your qualification will make a difference in the development of children. For many years ECD had been the “invisible child” hidden behind the family, disconnected from the recognition that its “older siblings” like primary secondary and tertiary education had received as key components in child development. The early years have now moved out of the shadows to a place of recognition in its own right. Being a project manager for the new BEd Degree in Early Childhood Care and Education, I can assure you that you have entered the ECD job market at the right time. You will flourish as teachers like you are needed. You will be needed not only in South Africa but globally. There is a lack of trained professionals in the ECD field. Early childhood development programmes have inadequate and inequitable access, especially for children younger than 3 years. Research indicates that 250 million children (43%) younger than 5 years in low-income and middle-income countries are at risk of not reaching their developmental potential due to inequity in ECD provision. Equitable early childhood policies and programmes are crucial for meeting Sustainable Development Goals, and for children to develop their intellectual skills, creativity, and well-being required to become healthy and productive adults. Research, programmes, and policies have advanced substantially since 2000, with new neuroscientific evidence linking early adversity and nurturing care with brain development and function throughout the life course. The first five years of a child’s life dictate the rest of his life… and consider yourself blessed to be part of this crucial developmental stage of the child’s life. Teaching in the early years is a calling, and once you are in practice with the little ones, you will begin to feel the grace of that calling. There is so much to celebrate and so much to be thankful for. Congratulations to every SANTS graduate on receiving their prestigious qualification. SANTS has provided you with a great education and you are now ready to enjoy the magical journey of being a Grade R educator. This is your opportunity to utilise the education you have received and to flourish in an environment committed to excellence. 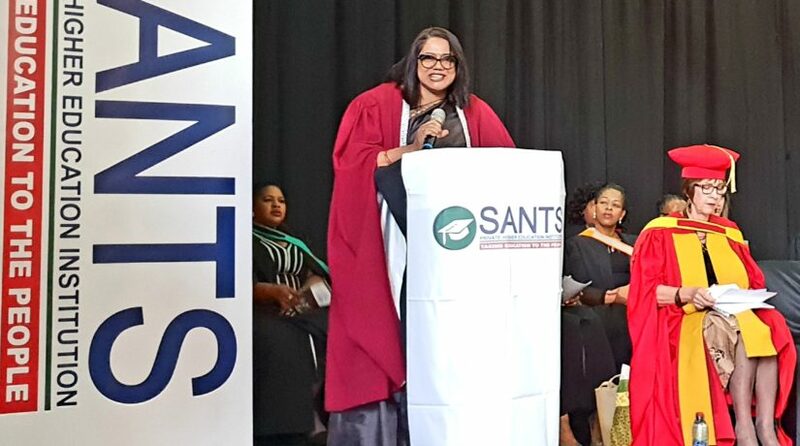 SANTS is celebrating 21 years in the field of education, and have produced in excess of 3 000 newly qualified teachers graduated from the Diploma in Grade R Teaching, B Ed Foundation and Intermediate programmes. Winston Churchill, the great British Statesman, said, “We shape our buildings: thereafter, they shape us” Just as SANTS has shaped you, you will shape the future generation as you, the graduates will be the first adult besides their family members whom they interact with. Embrace your responsibility with the respect and reflection and care- that it deserves. Remember that every learner is a mighty learner who is capable and competent. See the positive in every child and allow the child to initiate learning. Give the child a voice. Listen with both ears to the beauty of our children- and act with the decorum of a SANTS graduate- always respectful and humble every moment. I think that at this stage it is also important to acknowledge the Gauteng Department of Education (GDE) and the Matthew Goniwe School of Leadership and Governance (MGSLG), who have funded the majority of this cohort of Diplomas in Grade R Teaching students for the duration of their studies at SANTS. This initiative was rolled out across 25 districts of this province. To the class of 2018, as you sit before us this morning, a whole Early Childhood Development world awaits you. “I wish you the courage to be warm when the world prefers that you be cool. I wish you success sufficient to your needs. I wish you failure to temper your success. I wish you joy in all your days. I wish you humour and a twinkle in your eye. I wish you sunshine on your path and storms to season your journey. I wish you peace in the world in which you live and the smallest corner of the heart where truth is kept. I wish you faith to help define your living and your life. Enjoy a career of care and respect in the development of young children… the future generation. their lives (social-emotional physical perceptive and cognitive development) are in your capable hands. Make a positive difference in the life of every child you come in contact with, and so my message to you, in short, is “yes, you have the power to make a positive difference in the life of a child, go out and mould those beautiful little minds into masterpieces.